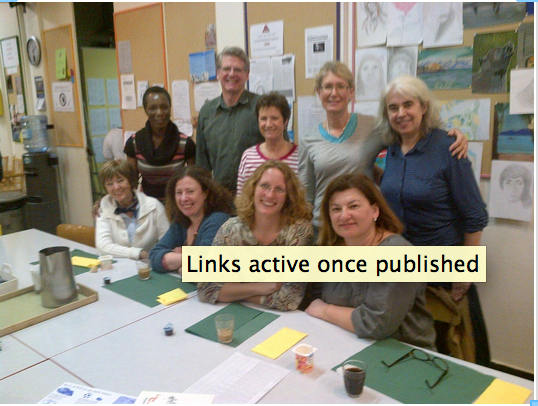 In September 2014, UUG committed to donating 25% of offerings collected during monthly gatherings every year to support Au Coeur des Grottes, a local Geneva safe-house for women and their children in difficulty. "Au Coeur des Grottes is a place of welcome, accompaniment and hosting for women in precarious situations, whether they are alone or with child/children. Thirty women and from fifteen to twenty-five children are residing daily at the shelter: women in difficult situations searching for security, mothers and children in need of protection, unsettled young girls faced with the unexpected difficulties of their opening lives, exploited or sexually abused foreign girls isolated by their ignorance of our country's language and customs, Swiss women returning from abroad, young students, victims of domestic violence, of human trade and slavery, of forced marriage or facing the risk of a crime of honor, pregnant women without any support... Violence, exploitation, victimization, trade of human beings, despair, contempt, loss of bearings..."
Volunteers helped out on several Saturdays to collect food at a supermarket for organizations who feed the hungry in the Geneva area. This is a program called the “Samedo du Partage.” One example from November 2016. We needed six volunteers for 3 hours shifts to collect food at the ALDI Store in Chene-Bourg. 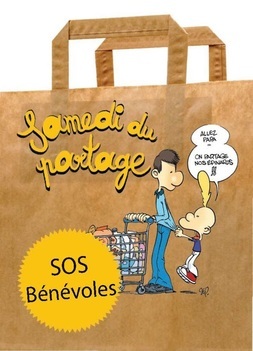 This was the third year that UUG participated in this Geneva-wide food collection program (most supermarkets in the Geneva area participate). The work involved handing out special paper bags and information about the Partage Program at the entrance to the store, and then collecting the bags that customers filled with recommended items, and then organizing the non-perishable food and personal health care items collected. Members signed up and let us know they were willing to work to make a difference and have fun while they were at it. This is a great program for children from ages 10 to 100. We are looking for members willing to help organize future events like this! Thank you to everyone who participated in this year's Lake Geneva Clean Up! A core practice of the UUG is to work with those in need in the Geneva. We pledge the offerings from our monthly services to a worthy local charitable organisation. 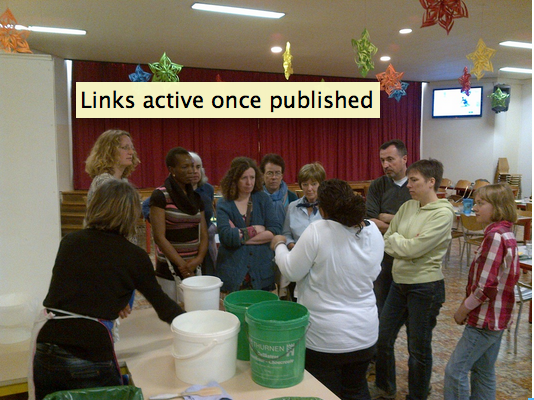 We also organise regular "hands-on" social action volunteer days where members of our congregation offer their time and talents to assist Geneva charitable organisations. See our social action work on facebook! Mr. Gosteli kindly offered UUG the opportunity to help prepare and serve meals on Saturday 28 March 2015 to 140 people. We organized 10 firmly committed volunteers. 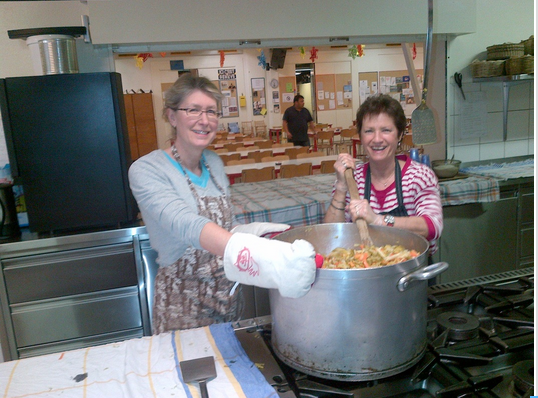 In particular, we will needed 3 French speaking volunteers to work in the kitchen and 7 volunteers to serve the meals and to clean away the dishes. The kitchen volunteers worked from 9:30 a.m. until 2:00 p.m., and the server volunteers worked from 11:00 am. until 2:00 p.m. Children starting age 10 were welcome, under adult supervision. People signed up with for either the kitchen shift 9:00 - 2:-00 pm (3 needed) or the serving and clean up shift 11:00-2:00 pm (7 needed). This volunteering opportunity was open to everyone, regardless of whether they have attended any UUG events in the past. Some adolescents signed up and got credit for doing charital volunteer work as required by a local international school. We did not ask for a commitment to UUG in any way--we are simply facilitating this opportunity for anyone who would like to participate. Le CARÉ is located on Rue du Grand-Bureau 13, in Les Acacias, Geneva (Tram 15, Acacias; Bus 11, Epinettes). AFTER THE EVENTS IN THE NIGHT OF 13 NOVEMBER 2015 IN PARIS, IT IS EVEN MORE IMPORTANT TO SHOW THAT UU of GENEVA STANDS ON THE SIDE OF LOVE, NOT WAR! Switzerland's recent anti-racism and anti-hate speech campaign, Bunte Schweiz, comes to an end with a free public event in the Paul Klee museum in Bern. UU of Basel & UU of Geneva Fellowships plan to meet there...Campaign participants, including companies and young people, will review the campaign and offer new perspectives and ways of preventing hate speech and racism on the internet in Switzerland. The event is free, conducted in German (Hochdeutsch) with simultaneous translation to French, and lunch is provided. Given the recent election outcome, this is an important opportunity for UUs in Switzerland to 'bear witness' to our belief in and commitment to the inherent worth and dignity of all people - especially for those of us who have no other voice in the Swiss democracy! At least 3 of us in Geneva planned to go and were to travel on the same train together.